Radioactive waste (or nuclear waste) is a material deemed no longer useful that has been contaminated by or contains radionuclides. Radionuclides are unstable atoms of an element that decay, or disintegrate spontaneously, emitting energy in the form of radiation. Radioactive waste has been created by humans as a by-product of various endeavors since the discovery of radioactivity in 1896 by Antoine Henri Becquerel. Since World War II, radioactive waste has been created by military weapons production and testing; mining; electrical power generation; medical diagnosis and treatment; consumer product development, manufacturing, and treatment; biological and chemical research; and other industrial uses. ©Tim Wright/Corbis. Reproduced by permission. mechanism by which it spontaneously releases its excess energy. Typical mechanisms for radioactive decay are alpha, beta, and gamma emission. Alpha decay is a process that is usually associated with heavy atoms, such as uranium-238 and thorium-234, where excess energy is given off with the ejection of two neutrons and two protons from the nucleus. Beta decay involves the ejection of a beta particle, which is the same as an electron, from the nucleus of an excited atom. A common example of a beta-emitter found in radioactive waste is strontium-90. After an alpha or beta decay, the nucleus of an atom is often in an excited state and still has excess energy. Rather than releasing this energy by alpha or beta decay, energy is lost by gamma emission—a pulse of electromagnetic radiation from the nucleus of an atom. Everything on Earth is exposed to radiation. However, exposure to radiation at levels greater than natural background radiation can be hazardous. Exposure to certain high levels of radiation, such as that from high-level radioactive waste, can even cause death. Radiation exposure can also cause cancer, birth defects, and other abnormalities, depending on the time of exposure, amount of radiation, and the decay mechanism. High-level radioactive waste from nuclear reactors can be hazardous for thousands of years. Radioactive waste can be categorized by its source or point of origin. Because of this, the governments of many nations have developed waste classification systems to regulate the management of radioactive waste within their borders. The proper treatment, storage, and disposal of radioactive waste are prescribed based on the waste classification system defined in a nation's laws, rules, and regulations. 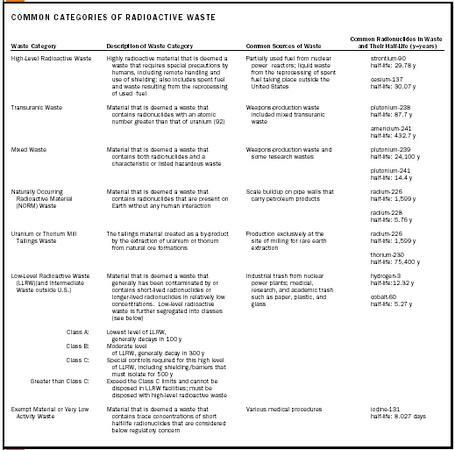 The table outlines common categories of radioactive waste. Radioactive waste can vary greatly in its physical and chemical form. It can be a solid, liquid, gas, or even something in between, such as sludge. Any given radioactive waste can be primarily water, soil, paper, plastic, metal, ash, glass, ceramic, or a mixture of many different physical forms. The chemical form of radioactive waste can vary as well. Radioactive waste can contain radionuclides of very light elements, such as radioactive hydrogen (tritium), or of very heavy elements, such as uranium. Radioactive waste is classified as high, intermediate, or low level. Depending on the radionuclides contained in it, a waste can remain radioactive from seconds to minutes, or even for millions of years. Radioactive waste management includes the possession, transportation, handling, storage, and ultimate disposal of waste. The safe management of radioactive waste is necessary to protect public health. If handled improperly, potential exposures of humans to high-level radioactive waste can be dangerous, even deadly. Some radioactive wastes such as certain types of transuranic waste can cause biological effects in humans only if the radionuclides contained in the waste are directly inhaled or ingested. Most low-level radioactive wastes can be handled by humans without any measurable biological effects. Nevertheless, good handling practices of all radioactive materials and waste should be the goal to provide optimum protection to humans and the environment. There have been historic practices associated with the use of radioactive material where workers were unaware of potential risks. The radium watch dial painters of the 1920s illustrate the health effects that can be associated with improper handling practices. The painters experienced high occurrences of cancer of the larynx and tongue due to ingestion of radium. The transportation of radioactive waste can occur via roadway, aircraft, ship/barge, and rail. The classification and physical size of radioactive waste dictate the method of transport, the packaging required, and the labeling necessary to allow for the shipment of a specific waste. There are international transportation requirements for radioactive waste, as well as more specific regulations in individual countries. following scenarios: shallow land burial; engineered disposal vaults; vertical shafts drilled into granite, salt, basalt, or volcanic rock; disposal cavities mined into specific rock formations such as salt; deeper-earth disposal into the submantle layer; above-ground isolation in engineered, concrete structures; recycling and reuse of waste material; radionuclide transmutation into nonradioactive material; ocean and seabed disposal; ice-sheet disposal; isolation disposal on a remote island; and even disposal in space. Most of the civilian high-level radioactive waste throughout the world is currently being stored at nuclear power reactor sites. The spent nuclear fuel generated from the 103 operating civilian power reactors in the United States is currently being stored on-site at the point of generation. In Europe, prior to on-site storage, spent fuel is first sent to either the Sellafield site in the United Kingdom or the La Hague site in France to be reprocessed in order to recover usable fuel. No reprocessing of commercial spent fuel is being conducted in the United States. In the United States, spent fuel and other high-level radioactive waste awaits the construction of a central, permanent repository. It is currently stored in spent fuel pools or, in some cases, in dry casks. 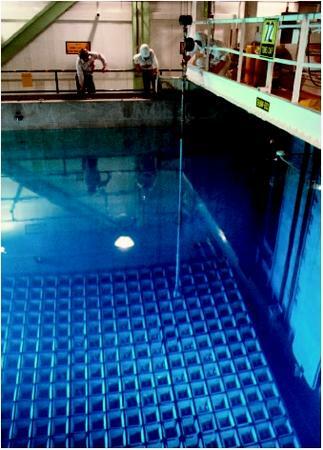 Spent fuel pools are water-filled, lead-lined chambers that are adjacent to reactors on civilian power reactor sites. Dry-cask storage has become necessary in some cases where the on-site spent fuel pools have reached capacity. The Office of Civilian Radioactive Waste Management at the U.S. Department of Energy (DOE) is charged with developing this federal repository. Amid local opposition, Yucca Mountain, Nevada, is presently under study to evaluate its suitability as a central repository for all U.S. high-level radioactive waste. The Yucca Mountain site has been officially designated by President George W. Bush and Congress for full-scale studies. There has been further emphasis placed on the security of spent fuel, and in general on nuclear reactor sites following the September 11, 2001, terrorist attacks. Nuclear reactor sites that store spent fuel have been identified as possible terrorist targets and, therefore, have been subject to heightened security and debate over potential vulnerabilities. France, Germany, the United Kingdom, and Japan also have plans to develop centralized repositories for high-level radioactive waste at various times in the future. Transuranic waste generated by the DOE has an operational final repository. The Waste Isolation Pilot Project located near Carlsbad, New Mexico, accepts transuranic waste and mixed transuranic waste (i.e., transuranic waste that also has a hazardous waste component) from federal facilities throughout the United States. This facility is comprised of disposal cavities mined into a salt formation some 2,150 feet underground. The disposal method used in the 1960s and 1970s for low-level radioactive waste was shallow land burial in earthen trenches. The infiltration of water into these trenches resulted in the migration or movement of certain radionuclides into surrounding soil and groundwater. To respond to such problems, engineered disposal units have been developed to replace shallow land burial, utilizing enhanced cover systems to reduce the potential for water infiltration. The trial-and-error nature of early radioactive waste disposal sites has rendered new facility development a slow and cautious process. The first commercial site for the disposal of low-level radioactive waste was opened in Beatty, Nevada, in 1962. Within the next ten years, five more sites opened in the United States: in Washington, Illinois, South Carolina, New York, and Kentucky. Private companies operated these sites on land leased from state governments. Prior to 1979, the DOE routinely used commercial sites for the disposal of federal waste. Migration problems at commercial disposal sites in the United States were first discovered in the late 1960s. Four of the six commercial low-level radioactive waste disposal sites in the United States closed. Three of the four sites that closed developed leaks due to erosion by surface water, subsidence on tops of trenches, or buried waste immersed in water. Several of these locations became federal Superfund sites due to radionuclides migrating beyond the disposal trenches, complicated by the presence of hazardous waste within the same facilities. The historical problems experienced with commercial radioactive waste disposal in the United States resulted in the development of new regulatory requirements for site selection, construction parameters, operating practices, and waste-acceptance criteria at future disposal sites. A new U.S. disposal regulation, Title 10, Code of Federal Regulations, Part 61, "Licensing Requirements for Land Disposal of Radioactive Wastes" was introduced in 1982. This regulation outlines the requirements necessary to ensure public health, safety, and the long-term protection of the environment. Since the development of this new regulation in the United States, only one site, in Clive, Utah, has been licensed and opened for disposal of low-level radioactive waste. Radioactive waste is being generated in the United States and throughout the world as a result of research, mining, electricity production, nuclear weapons production, and medical uses. There are many possible beneficial activities due to the use of radioactive material. Laws, rules, and regulations are made on a global scale to help ensure the safe handling of radioactive waste to protect human and environmental health. However, the question of the safe final deposition of all radioactive waste generated worldwide is still problematic. SEE ALSO C LEANUP ; E NERGY, N UCLEAR ; S UPERFUND ; W ASTE, T RANSPORTATION OF ; Y UCCA M OUNTAIN . League of Women Voters Education Fund. (1993). The Nuclear Waste Primer. New York: Lyons & Burford, Publishers. Murray, Raymond L. (1994). Understanding Radioactive Waste, 4th edition. Columbus, OH: Battelle Press. Parrington, Josef R.; Knox, Harold D.; Breneman, Susan L.; Baum, Edward M.; and Feiner, Frank. (1996). Nuclides and Isotopes, 15th edition. San Jose, CA: General Electric Company. International Atomic Energy Agency. "World Atom." Available from http://www.iaea.or.at/worldatom . U.S. Department of Energy, Office of Civilian Radioactive Waste Management. "The Yucca Mountain Project." Available from http://www.ymp.gov . U.S. Nuclear Regulatory Commission. "Radioactive Waste." Available from http://www.nrc.gov/waste.html . Waste Link Directory. "Guide to Radioactive Waste." Available from http://www.radwaste.org/general.htm .